Above: George McJunkin, discoverer of the Folsom Site, on his horse, Headlight. Reaching only 4,956 feet, Tucumcari Mountain casts a shadow over the eastern plains. Explorers and pioneers used it as a landmark, and folklorists clung to a local legend involving the deaths of Tocom, an Indian warrior, and his lover, Kari, the chief’s daughter. In despair, the chief purportedly cried out, “Tocom! Kari!” New Mexico place-names expert Robert Julyan, though, says the name more likely derives from a Comanche word for “lookout”—which the mountain handily provided. (Today it’s private property.) —Excerpted from Roadside New Mexico: A Guide to Historic Markers, by David Pike (UNM Press). Calling New Mexico “tricultural” leaves out a lot of people. To bridge that gap, each February, the New Mexico Black History Organizing Committee stages programs to remind New Mexicans of others&apos; contributions, says Cathryn McGill, the committee’s founder and director. One of the earliest Spanish expeditions included an African. Buffalo Soldiers were sent to the state near the end of the Civil War to protect white settlers. Through the second half of the 19th century, black families wanting to get away from the South sought opportunities and equality in New Mexico, even creating the short-lived town of Blackdom, near Roswell. 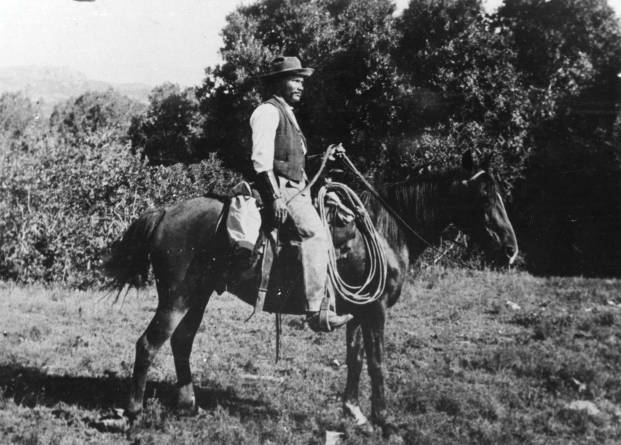 The cowboy who discovered the Folsom Site, which caused archaeologists to radically adjust the starting point for human presence in the Southwest, was George McJunkin, a former slave. Black people built businesses, opened medical practices, and won elected offices. Roots Revival: Scattered/Unshattered takes over the Kimo Theater in Albuquerque February 1–3, using music, dance, and an original script inspired by a West African folktale to talk about preserving black culture. Other events include concerts, film screenings, a scholarship fund-raising gala, and the fourth annual Asante Awards, recognizing Dr. William McIver, one of the first black surgeons in the state. Governor Francisco Cuervo y Valdes founded the villa of San Francisco de Alburquerque on February 7, 1706, naming it for the Duke of Alburquerque, who lived in New Spain (Mexico). Historians disagree on how that extra r was lost. On February 13, 1879, the first passenger train chugged into New Mexico by way of Ratón Pass, on the Atchison, Topeka and Santa Fe line. The February 18, 1878, murder of rancher John Tunstall inflamed his young cowherds, including Billy the Kid, whose revenge quickly grew into the Lincoln County War.